Pour bag of white miniature marshmallows into large shallow bowl. Spoon 2 tablespoons of the frosting into small bowl; tint with food color to desired shade of pink for nose; set aside. Pipe or spread remaining frosting on cupcakes (frosting will be slightly mounded). Press top of each cupcake into marshmallows, covering top completely. Place cupcakes on platter, fitting snugly together. 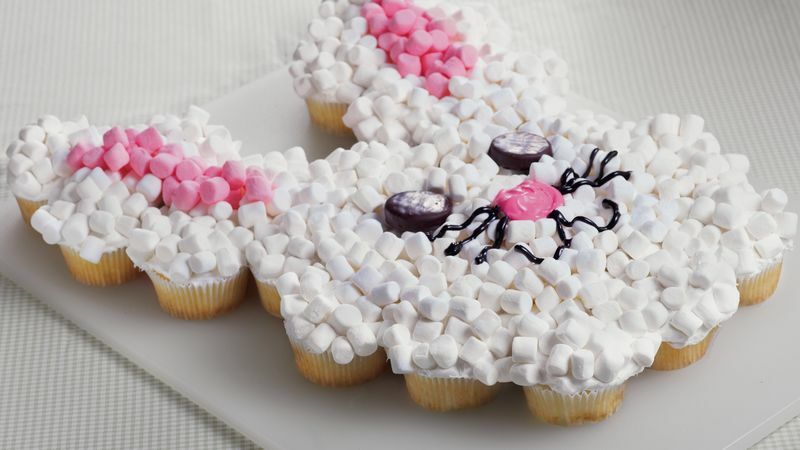 Sprinkle leftover marshmallows as needed to fill in any gaps between cupcakes forming face. Sprinkle pink marshmallows in center of each ear. Place peppermint patties on face for eyes. Pipe or spread pink frosting on face for nose. Pipe 3 (3-inch) lines with black decorating gel on either side of nose for whiskers; pipe 2 lines below nose for mouth. (Or, cut 6 thin 3-inch pieces of licorice for whiskers and 2 thin 5-inch strips of licorice for mouth; arrange on face.) Store loosely covered. If you cannot find the fruit-flavored miniature marshmallows, tint additional frosting pink and pipe or frost the center of the ears pink. Paste or liquid food color can be substituted for the gel food color.